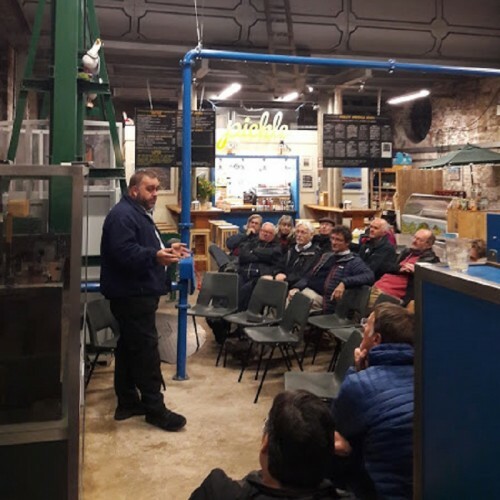 In November Underfall Yard Volunteers and staff were updated by Bristol City Council’s Docks Engineer Ian Johnson on his plans for the Harbour in 2019 and beyond. Following Ian’s talk, volunteers were invited to ask questions about water management in the Harbour. During a wide-ranging and fascinating session many interesting points were highlighted. Docks Engineer Ian Johnson addresses Underfall Yard volunteers. Since it was last dredged in 2015 the Harbour has acquired 62,000 cubic metres of silt which has created some shallow areas. Water injection dredging will be used to clear the silt. This will involve injecting water at low pressure into the silt to create a slurry. Since there is a current through the Harbour the slurry will flow towards the Entrance Locks and the deep sluice at the Underfall Yard, from where it will be released at low tide and washed out to sea. 2019 will see the commencement of the most detailed survey of the Harbour’s walls, bed and depth ever undertaken. Much of the data collected will be made available to the public. Redcliffe Bascule Bridge is the only Bridge on the Harbour that lifts rather than swings and investigations are underway to get it working again. Often overlooked, Netham Weir is critical as it controls the height of the water in the Floating Harbour. The River Frome reacts very quickly to heavy rain. The Environment Agency operate an interceptor in Eastville (beside Ikea’s carpark) which is crucial to stop Bristol from flooding. The hydraulic machinery that operates the Entrance Locks sits on concrete plinths that are calculated to offer protection from the anticipated ‘100-year flood’. After some forty years of post-industrial redevelopment, the Harbour is now ecologically ‘clean’. Bristol’s cormorants (and the fish they eat) are good evidence of this. The Harbour becomes less salty as one moves away from the Cumberland Basin. This can be seen in the different species of fish found at different parts of the Harbour. We are very grateful to Ian for sharing his expertise and knowledge with us and illuminating the essential work carried out by his team from the Underfall Yard. Underfall Yard has many volunteering opportunities in several different roles from explaining the Yard and the Harbour to visitors to helping repair historic machinery in our workshop. Please see here for more information.